Russian River Turns Blood Red… Will Locusts, Flies, and Frogs Appear Next? 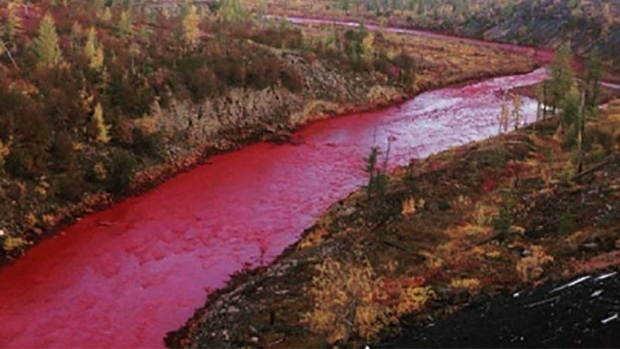 Social media is abuzz over reports that a river in Russia has turned blood red! Some netizens are joking that locusts, flies, and frogs could appear next, in clear reference to the Biblical 10 plagues that had supposedly hit Egypt after the Pharaoh refused to let the Israelites go. But this blood red river has nothing to do with the Israelites or the Egyptians but could actually be just a result of a leak in the waste pipes of the giant metals plant upstream. Daldykan River in the city of Norilsk had turned blood red recently – and the locals accused huge metals company Norilsk Nickel of being the perpetrator. Others are pointing their fingers at Hope Metals Plant whose wastewater could be mixing mineral ore with the river’s water but other are also saying it is a smelting plant that is making the river turn red. Right now, Russia’s Environment Ministry still has to determine which of these plants could be causing the damage to the river but the companies were quick to deny responsibility, saying there were no leaks in their systems. The locals believe, and rightfully so, that one of these plants was truly responsible for making the river turn red while the older residents revealed that this is not the first time this has happened. The Association of the Indigenous Peoples of the Taimir Peninsula is planning to submit a formal complaint in behalf of the native communities in the area, says leader Grigory Dukarev. According to Dukarev, they had previously complained about the changes in the color of the water due to the runoffs from the plants upstream but was told that these were safe and will only cause minimal ecological damage. Social media user Evgeny Belikov who claims to be working at Hope Plant says the river’s color most certainly comes from the company’s reservoir as most of the workers in the company often refer to its waters as the “red sea”; somehow, pipes must have leaked towards the river. He also said that during winter, they get red snow in the area. While he thinks the red snow was ‘pretty’, he knows it is dangerous because of the chemicals.